Nebkheperure Tutankhamun (alternately spelled with Tutenkh-, -amen, -amon, Egyptian twt-ˁnḫ-ı͗mn; *tuwt-ʕankh-yamān) was a Pharaoh of the eighteenth dynasty (ruled 1333 B.C.E.–1324 B.C.E. ), during the period of Egyptian history known as the New Kingdom. His original name, Tutankhaten, meant "Living Image of Aten," while Tutankhamun meant "Living Image of Amun." He is possibly also the Nibhurrereya of the Amarna letters. He was likely the eighteenth dynasty king "Rathotis," who according to Manetho, an ancient historian, had reigned for 9 years—a figure which conforms exactly with Flavius Josephus' generally accurate version of Manetho's Epitome. In historical terms, Tutankhamun is of only moderate significance, and most of his modern popularity stems from the fact that his tomb in the Valley of the Kings was discovered almost completely intact. However, he is also significant as a figure who managed the beginning of the transition from the heretical Atenism of his predecessors Akhenaten and Smenkhkare back to the familiar Egyptian religion. As Tutankhamun began his reign at age 9, his vizier and eventual successor Ay was probably making most of the important political decisions during Tutankhamun's reign. Nonetheless, Tutankhamun is, in modern times, one of the most famous of the Pharaohs, and the only one to have a nickname in popular culture ("King Tut"). The 1922 discovery by Howard Carter of Tutankhamun's nearly intact tomb (subsequently designated KV62) received worldwide press coverage and sparked a renewed public interest in ancient Egypt, of which Tutankhamun remains the popular face. Tutankhamun's parentage is uncertain. An inscription calls him a king's son, but it is not clear which king was meant. Most scholars think that he was probably a son either of Amenhotep III (though probably not by his Great Royal Wife Tiye), or more likely a son of Amenhotep III's son Akhenaten around 1342 B.C.E. However, Professor James Allen argues that Tutankhamun was more likely to be a son of the short-lived king Smenkhkare rather than Akhenaten. Allen argues that Akhenaten consciously chose a female co-regent named Neferneferuaten to succeed him rather than Tutankhamun, which is unlikely if the latter was indeed his son. The first theory was that he was a son of Amenhotep III and Queen Tiye. This theory seems unlikely since Tiye would have been over 50 at the time of Tutankhamun's birth, too old to produce any more offspring. 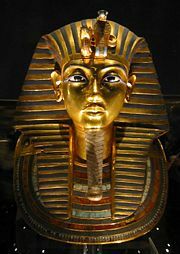 Another theory is that Tutankhamun was the son of Smenkhkare and Meritaten. This is possible but not plausible. Smenkhkare came on the scene when Akhenaten entered the 14th year of his reign and during this time Meritaten married Smenkhkare. So, if Smenkhkare is the father of Tutankhamun, he would have needed at least a three year reign, because if it had been shorter, Tutankhamun would have been barely seven when he came to the throne. However, if there had been lengthy co-regency between Amenhotep III and Akhenaten, Amenhotep could definitely be Tutankhamun's father. The most current theory is that he was the son of Akhenaten and his minor wife Kiya. Queen Kiya's title was "Greatly Beloved Wife of Akhenaten" so it is possible she could have borne him an heir. Supporting this theory, images on the tomb wall in the tomb of Akhenaten show that a royal fan bearer standing next to Kiya's death bed, fanning what is either a princess or most likely a wet nurse holding a baby, which would indicate that the wet nurse was holding the boy-king-to-be. Tutankhamun was married to Ankhesenpaaten (possibly his sister), and after the re-establishment of the traditional Egyptian religion the couple changed the –aten ending of their names to the –amun ending, becoming Ankhesenamun and Tutankhamun. They had two known children, both stillborn girls—their mummies were discovered in his tomb. During Tutankhamun's reign, Akhenaten's Amarna revolution (Atenism) began to be reversed. Akhenaten had attempted to supplant the existing priesthood and gods with a god who was until then considered minor, Aten. In Year 3 of Tutankhamun's reign (1331 B.C.E. ), when he was still a boy of about 11 and probably under the influence of two older advisers (notably Akhenaten's vizier Ay), the ban on the old pantheon of gods and their temples was lifted, the traditional privileges restored to their priesthoods, and the capital moved back to Thebes. 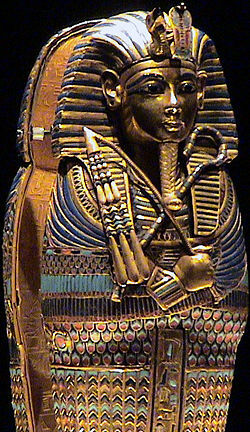 The young pharaoh also adopted the name Tutankhamun, changing it from his birth name Tutankhaten. Because of his age at the time these decisions were made, it is generally thought that most if not all the responsibility for them falls on his vizier Ay and perhaps other advisers. Also, King Tutankhamun restored all the old gods and brought order to the chaos that his relative had caused. He built many temples devoted to Amun-Ra. Tutankhamun's wooden box depicts him going to war against Hittites and Nubians suggesting that he may have possibly gone to war in the last few years of his reign, and perhaps even died in the campaign. A now-famous letter to the Hittite king Suppiluliuma I from a widowed queen of Egypt, explaining her problems and asking for one of his sons as a husband, has been attributed to Ankhesenamun (among others). Suspicious of this good fortune, Suppiluliumas I first sent a messenger to make inquiries on the truth of the young queen's story. After reporting her plight back to Suppiluliuma I, he sent his son, Zannanza, accepting her offer. However, Zananza got no further than the border before he was killed according to the Hittite archives. If Ankhesenamun were the queen in question, and his death a murder, it was probably at the orders of either Horemheb or Ay, who both had the opportunity and the motive to kill him. At the reintroduction of the old pantheon, his name was changed. It is transliterated as twt-ˁnḫ-ỉmn ḥq3-ỉwnw-šmˁ, and often realized as Tutankhamun Hekaiunushema, meaning "Living image of Amun, ruler of Upper Heliopolis." On his ascension to the throne, Tutankhamun took a praenomen. This is translated as nb-ḫprw-rˁ, and realized as Nebkheperure, meaning "Lord of the forms of Re." The name Nibhurrereya in the Amarna letters may be a variation of this praenomen. For a long time the cause of Tutankhamun's death was unknown, and was the root of much speculation. He was only 18 when he died but did he suffer from any physical abnormalities? Had he been murdered? Many of these questions were finally answered in early 2005 when the results of a set of CT scans on the mummy were released. The body was originally inspected by Howard Carter’s team in the early 1920s, though they were primarily interested in recovering the jewelry and amulets from the body. To remove the objects from the body, which in many cases were stuck fast by the hardened embalming resins used, Carter's team cut up the mummy into various pieces: the arms and legs were detached, the torso cut in half and the head was severed. Hot knives were used to remove it from the golden mask to which it was cemented by resin. Since the body was placed back in its sarcophagus in 1926, the mummy has subsequently been X-rayed three times: First in 1968 by a group from the University of Liverpool, then in 1978 by a group from the University of Michigan and finally in 2005, a team of Egyptian scientists led by Secretary General of the Egyptian Supreme Council of Antiquities Dr. Zahi Hawass conducted a CT scan on the mummy. X-rays of his mummy, which were taken previously, in 1968, had revealed a dense spot at the lower back of the skull. This had been interpreted as a chronic subdural hematoma, which would have been caused by a blow. Such an injury could have been the result of an accident, but it had also been suggested that the young pharaoh was murdered. If this is the case, there are a number of theories as to who was responsible: One popular candidate was his immediate successor Ay (other candidates included his wife and chariot-driver). Interestingly, there are seemingly signs of calcification within the supposed injury, which if true meant Tutankhamun lived for a fairly extensive period of time (on the order of several months) after the injury was inflicted. Much confusion had been caused by a small loose sliver of bone within the upper cranial cavity, which was discovered from the same X-ray analysis. Some people have suggested this visible bone fragment for the supposed head injury. In fact, since Tutankhamun's brain was removed post mortem in the mummification process, and considerable quantities of now-hardened resin introduced into the skull on at least two separate occasions after that, had the fragment resulted from a pre-mortem injury, some scholars, including the 2005 CT scan team, say it almost certainly would not still be loose in the cranial cavity. But other scientists suggested, that the loose sliver of bone was loosened by the embalmers during mummification, but it had been broken before. A blow to the back of the head (from a fall or an actual blow), caused the brain to move forward, hitting the front of the skull, breaking small pieces of the bone right above the eyes. On March 8, 2005, Egyptian archaeologist Zahi Hawass revealed the results of a CT scan performed on the pharaoh's mummy. The scan uncovered no evidence for a blow to the back of the head as well as no evidence suggesting foul play. There was a hole in the head, but it appeared to have been drilled, presumably by embalmers. A fracture to Tutankhamun's left thighbone was interpreted as evidence that suggests the pharaoh badly broke his leg before he died, and his leg became infected; however, members of the Egyptian-led research team recognized, as a less likely possibility, that the fracture was caused by the embalmers. 1,700 images were produced of Tutankhamun's mummy during the 15 minute CT scan. The research also showed that the pharaoh had cleft palate. Much was learned about the young king's life. His age at death was estimated at 19 years, based on physical developments that set upper and lower limits to his age. The king had been in general good health, and there were no signs of any major infectious disease or malnutrition during childhood. He was slight of build, and was roughly 170 cm (5'7") tall. He had large front incisor teeth and the overbite characteristic of the rest of the Thutmosid line of kings to which he belonged. He also had a pronounced dolichocephalic (elongated) skull, though it was within normal bounds and highly unlikely to have been pathologic in cause. Given the fact that many of the royal depictions of Akhenaten (possibly his father, certainly a relation), often featured an elongated head, it is likely an exaggeration of a family trait, rather than a distinct abnormality. A slight bend to his spine was also found, but the scientists agreed that there was no associated evidence to suggest that it was pathological in nature, and that it was much more likely to have been caused during the embalming process. This ended speculation based on the previous X-rays that Tutanhkamun had suffered from scoliosis. The 2005 conclusion by a team of Egyptian scientists, based on the CT scan findings, confirmed that Tutankhamun died of a swift attack of gangrene after breaking his leg. After consultations with Italian and Swiss experts, the Egyptian scientists found that the fracture in Tutankhamun's left leg most likely occurred only days before his death, which had then become gangrenous and led directly to his death. The fracture was not sustained during the mummification process or as a result of some damage to the mummy as claimed by Howard Carter. The Egyptian scientists have also found no evidence that he had been struck in the head and no other indication he was killed, as had been previously speculated. Further investigation of the fracture led to the conclusion that it was severe, most likely caused by a fall from some height—possibly a riding accident due to the absence of pelvis injuries—and may have been fatal within hours. Despite the relatively poor condition of the mummy, the Egyptian team found evidence that great care had been given to the body of Tutankhamun during the embalming process. They found five distinct embalming materials, which were applied to the body at various stages of the mummification process. This counters previous assertions that the king’s body had been prepared carelessly and in a hurry. In November 2006, at the annual meeting of the Radiological Society of North America, Egyptian radiologists stated that that CT images and scans of the king's mummy revealed Tutankhamun's height to be 180 centimeters or 5 feet 11 inches tall. Tutankhamun seems to have faded from public consciousness in ancient Egypt within a short time after his death, and he remained virtually unknown until the early twentieth century. His tomb was robbed at least twice in antiquity, but based on the items taken (including perishable oils and perfumes) and the evidence of restoration of the tomb after the intrusions, it seems clear that these robberies took place within several months at most of the burial itself. Subsequently, the location of the tomb was lost because it had come to be buried by stone chips from subsequent tombs, either dumped there or washed there by floods. In the years that followed, some workers huts were built over the tomb entrance, clearly not knowing what lay beneath. When at the end of the 20th dynasty the Valley of the Kings burials were systematically dismantled, the burial of Tutankhamun was overlooked, presumably because it had been lost and even his name may have been forgotten. Some of the treasures in Tutankhamun's tomb are noted for their apparent departure from traditional depictions of the boy king. Certain cartouches where the king's name should appear have been altered, as if to usurp the property of a previous pharaoh. However, this may simply be the product of "updating" the artifacts to reflect the shift from Tutankhaten to Tutankhamun. Other differences are less easy to dispense, such as the older, more angular facial features of the middle coffin and canopic coffinettes. The most widely accepted theory for these latter variations is that the items were originally intended for Smenkhkare, who may or may not be the mysterious KV55 mummy. Said mummy, according to craniological examinations, bears a striking first-order (father-to-son, brother-to-brother) relationship to Tutankhamun's. 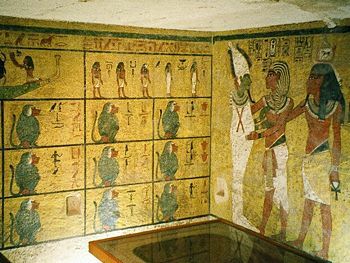 If Tutankhamun is the world's best known pharaoh, it is partly because his tomb is among the best preserved, and his image and associated artifacts the most-exhibited. As Jon Manchip White writes, in his forward to the 1977 edition of Carter's The Discovery of the Tomb of Tutankhamun, "The pharaoh who in life was one of the least esteemed of Egypt's kings has become in death the most renowned." Perhaps we will never know what exactly happened to him in a cold winter day in the year 1324 B.C.E. (based on the types of flowers found in his tomb, it can be assumed that he was interred on March/April, so he would have died between 70-90 days before that, as that much time is required for mummification and other related funeral processes). The most likely reason could be the injuries from a chariot accident. The major contribution of the boy king could easily be his hastily-prepared tomb, resulting from his untimely death. The spectacular discovery, the sheer size of wealth uncovered, the beautiful artifacts that depicted the love and affection between the ill-fated young royal couple and the flowers placed on the golden mask of the mummy—about which Carter wrote that he would like to imagine them as placed by Ankhesenamun just before the closing of the casket—the list can be endless. All these fueled the imagination of the global public and raised interest in ancient Egypt and its culture to an unprecedented level throughout the world. 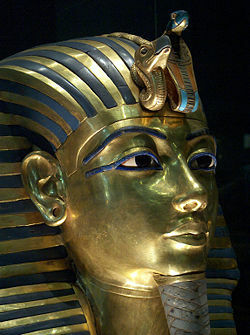 In 2005, three teams of scientists (Egyptian, French and American), in partnership with the National Geographic Society, developed a new facial likeness of Tutankhamun. The Egyptian team worked from 1,700 three-dimensional CT scans of the pharaoh's skull. The French and American teams worked plastic molds created from these—but the Americans were never told whom they were reconstructing. All three teams created silicone busts of their interpretation of what the young monarch looked like. Though modern technology can reconstruct Tutankhamun's facial structure with a high degree of accuracy based on CT data from his mummy, correctly determining his skin tone is impossible. The problem is not a lack of skill on the part of Ancient Egyptians. Egyptian artisans distinguished accurately among different ethnicities, but sometimes depicted their subjects in totally unreal colors, the purposes for which aren't completely understood. Thus, no absolute consensus on King Tut's skin tone is possible. The big variable is skin tone. North Africans, we know today, had a range of skin tones, from light to dark. In this case, we selected a medium skin tone, and we say, quite up front, "This is midrange." We'll never know for sure what his exact skin tone was or the color of his eyes with 100 percent certainty. …Maybe in the future, people will come to a different conclusion. A wooden statue head of Queen Tiye, thought to be Tutankhamun's Grandmother, part of the Ägyptisches Museum Berlin collection. Fragmentary statue of Akhenaten, Tutankhamun's father. On display at the Cairo Museum. Plaster face of a young Amarna-era woman, thought to represent Queen Kiya, the likely mother of Tutankhamun. On display at the Metropolitan Museum of Art, New York City. Canopic jar depicting an Amarna-era Queen, usually identified as being Queen Kiya. On display at the Metropolitan Museum of Art, New York City. The iconic image of Queen Nefertiti, the step-mother of Tutankhamen, part of the Ägyptisches Museum Berlin collection. Another statue head depicting Nefertiti, now part of the Ägyptisches Museum Berlin collection. Fragmentary statue thought to represent Ankhesenamun, sister and wife to Tutankhamun, on display at the Brooklyn Museum. Statue of an unnamed Amarna-era princess, a likely sister (or step-sister) to Tutankhamun. Part of the Ägyptisches Museum Berlin collection. It is important to know the first reconstruction by English, Australian and American scientist actual depicted African phenotypes, which were the common phenotypes throughout Africa during that time. The splendors of Tutankhamun's tomb are among the most traveled artifacts in the world. They have been to many countries, but probably the best-known exhibition tour was the Treasures of Tutankhamun tour, which ran from 1972-1979. This exhibition was first shown in London at the British Museum from 30 March until 30 September 1972. More than 1.6 million visitors came to see the exhibition, some queueing for up to eight hours and it was the most popular exhibition ever in the Museum. The exhibition moved on to many other countries, including the U.S., USSR, Japan, France, Canada and West Germany. The exhibition in the United States was organized by the Metropolitan Museum of Art and ran from from November 17, 1976 through March 15, 1977. It was attended by more than eight million people in the United States. "…55 objects from the tomb of Tutankhamun included the boy-king's solid gold funeral mask, a gilded wood figure of the goddess Selket, lamps, jars, jewelry, furniture, and other objects for the afterlife. This exhibition established the term "blockbuster." A combination of the age-old fascination with ancient Egypt, the legendary allure of gold and precious stones, and the funeral trappings of the boy-king created an immense popular response. Visitors waited up to 8 hours before the building opened to view the exhibition. At times the line completely encircled the West Building." In 2005, hoping to inspire a whole new generation, Egypt's Supreme Council of Antiquities, in partnership with Arts and Exhibitions International and the National Geographic Society, launched a new tour of Tutankhamun's treasures, this time called "Tutankhamun and the Golden Age of the Pharaohs." It was expected to draw more than three million people. The exhibition started in Los Angeles, California, then moved to Fort Lauderdale, Florida, and Chicago. It is currently in Philadelphia, Pennsylvania, and will move on to London before finally returning to Egypt in early 2008. ↑ Digital Egypt for Universities, Tutankhamun. Retrieved July 7, 2007. ↑ Brier, Bob. The Murder of Tutankhamen: A True Story (New York: Putnam, 1998, ISBN 9780399143830). ↑ Michael R. King, Gregory M. Cooper, and Don DeNevi, Who killed King Tut? : Using Modern Forensics to Solve a 3,300-Year-Old Mystery (Amherst, NY: Prometheus Books, 2004, ISBN 9781591021834). ↑ National Geographic, King Tut Not Murdered Violently. Retrieved July 7, 2007. ↑ C.N. Reeves, The Complete Tutankhamun: The King, the Tomb, the Royal Treasure (London: Thames and Hudson, 1990, ISBN 9780500050583). ↑ National Geographic, King Tut's New Face: Behind the Forensic Reconstruction. Retrieved July 7, 2007. ↑ NGA, Treasures of Tutankhamun (11/1976). Retrieved July 7, 2007. 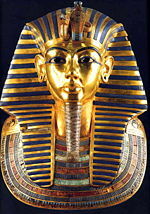 ↑ King Tut Exhibition, Tutankhamun & the Golden Age of the Pharaohs. Treasures from the Valley of the Kings. Retrieved July 7, 2007. Carter, Howard, and A. C. Mace. The Discovery of the Tomb of Tutankhamen. New York: Dover Publications 1977. ISBN 9780486235004. Desroches-Noblecourt, Christiane. Tutankhamen: Life and Death of a Pharaoh. London: Penguin Books 1989. ISBN 9780140116656. Edwards, I. E. S. Treasures of Tutankhamun. New York: Ballantine Books 1976. ISBN 9780345256843. Egyptian Supreme Council of Antiquities. The Mummy of Tutankhamun: the CT Scan Report. In Ancient Egypt June/July 2005. Haag, Michael. The Rough Guide to Tutankhamun. London: Rough Guides Ltd 2005. ISBN 9781843535546. James, T. G. H., and Araldo De Luca. Tutankhamun. Vercelli, Italy: Friedman/Fairfax Publishers 2000. ISBN 9781586630324. This page was last modified on 24 December 2015, at 16:04.